Do you feel awkward in social situations? Do you have a hard time interacting with people? Do you prefer keeping to yourself even when you secretly wish you can be as outgoing as other people? If you answered yes to any of these questions, then this book is for you. 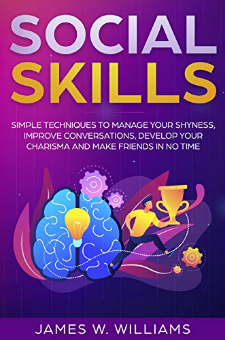 Social Skills: Simple Techniques to Manage Your Shyness, Improve Conversations, Develop Your Charisma and Make Friends In No Time is a pragmatic book written in a down-to-earth manner showing exactly how to develop your social skills. You can unlock your potentials by applying the tips shared in this book.In this book you will discover:Practical steps to help you overcome shynessHow to boost your self-confidenceEasy ways to influence and charm peoplePractical ways to keep your audience or listener engagedHow to manage awkward social situationsConversation skills to make your interactions flow seamlesslyIf you are tired of vague tips on improving social skills, or if you have little or no improvement with the several other social skills books you have read in time past, this book will break the jinx. The methods in this book have been tested and they work, plain and simple.Get your copy today and learn how to put the magic back into your social interactions.